Business on THE ENVIRONMENTALIST: What's the True Cost of Photocopy Paper? At the moment, despite vigorous protests from a coalition of well known local and foreign environmental groups and scientists, APP, as the world’s largest paper company (in terms of forest clearance), looks set to go ahead with the operation, slamming current environmental concerns. 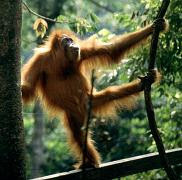 The area to be cleared is natural forest outside the Bukit Tigapuluh National Park in Jambi Province in central Sumatra. It is already one of the most endangered forests on all of Sumatra, and to cap it all, Sumatra itself is already suffering from possibly the fastest deforestation rate in the world. With this latest acquisition, APP and its associated companies could convert all remaining natural forest in the province outside the national park – 200,000 hectares of tropical forest – despite it being one of the most important areas for biodiversity in Indonesia. As further details leak out and protest petitions are launched, the illogical short termism and needless destruction is infuriating for multiple reasons. Two minority indigenous tribes – the Talang Mamak and Orang Rimba – both live inside Bukit Tigapuluh’s natural forest and depend on natural resources from the forest and river for their existence. Zoologists have also warned that deforestation could cause more attacks on humans by Sumatran tigers as they lose their forest home. Nine people have been killed by tigers in the region so far this year and the numbers, say experts, could soar if there is less forest. This would be hard to refute, but there is no specific mention how indigenous tribes will continue to live from the forest, or be protected from wildlife attacks, nor if the work will continue into the future, or be a mere stop gap leaving communities with nothing when the final tree has been felled. The logging operation will destroy the forest home of 100 great apes that are part of the only successful reintroduction programme for Sumatran orangutans. It took scientists decades to discover how to successfully reintroduce critically endangered orangutans from captivity into the wild, yet it could take APP just months to destroy an important part of their new habitat. This week the Indonesian Director General (DG) of Biodiversity and Conservation, Mr Dirori will be discussing the case in Australia because an orangutan from the Perth Zoo was the first zoo-born ape to be released in Bukit Tigapuluh. This unprotected forest is essential habitat for an estimated 100 of the last 400 critically endangered Sumatran tigers left in the wild. According to its own Wikipedia dispute page, APP concedes it is fair to say that it was investigated for illegal logging and that large paper sellers in the U.S., Europe and Asia, including Office Depot Inc., stopped buying from APP in recent years because of alleged environmental misdeeds. It was keen that the word “alleged” was included. In November 2007, the Forest Stewardship Council (FSC) decided to rescind the rights of APP to use its certified wood logo and an investigation published in March 2008 by an environmental coalition called Eyes on the Forest showed evidence of a new road built by APP, heading through the Kampar peninsula, one of the world's largest contiguous tropical peat swamp forests, with more carbon per hectare than any other ecosystem on Earth. The investigation found tracks on the new road of the critically endangered Sumatran Tiger, whose wild population has been reduced to around 400 individuals. APP claimed that it was building this state-of-the-art, paved highway for the benefit of the local communities, though satellite imagery shows that the road does not go anywhere near the two settlements. APP and its parent company Sinar Mas Group reject the current accusations of conservation groups, saying that the Bukit Tigapuluh forest was not protected and that the presence of their loggers would prevent illegal logging. APP stands ready to work with all stakeholders who share our objectives of balanced sustainable development in Indonesia. A multi-stakeholder approach grounded in science, engendered with mutual trust, and in adherence with the national and local laws and regulations of Indonesia are preconditions for the development of sustainable projects. [a] credible independent multi-stakeholder team will be set up to assess the ecological and social condition of the surrounding areas of BTNP,” and “APP will respect the findings of the independent, multi-stakeholder team and support the decision made by the Government. This all seems entirely reasonable and it would be wrong to pre-empt future decisions. However, it is hard to remain entirely optimistic judging past performance and previous false promises. Sumatra is a very special place. 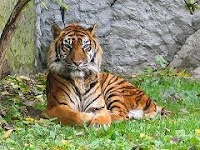 It is the only site in the world where tigers, elephants, rhinos and orangutans occur. It contains nine “tiger conservation landscapes” identified by experts as important habitat for Sumatran tigers and is home to the forest with the greatest vascular plant diversity of any lowland forest ever studied. Added to this, it is estimated to contain the largest store of peat carbon in Southeast Asia under its peat forests. I think if we all knew it was disappearing for photocopy paper and tissue, we’d be appalled. All of this is doubly senseless as there are alternatives. Whilst many conservation groups are not against pulpwood and oil palm development, they say it shouldn’t be at the expense of natural forest. WWF recommends developing agricultural plantations on so called “wasteland” - land where natural forest has been cleared but not replanted. WWF Indonesia has identified approximately 900,000 hectares of wasteland in Sumatra. The commitment was celebrated publicly at the IUCN World Conservation Congress in Barcelona, Spain, in October 2008 and this project falls within this definition. This is an instance where it would be good to see if words really are mighty and can take on chainsaws - or if they were just empty promises and literally not worth the paper they were written on. Joanna Benn, who works with the United Nations Environmental Programme in Africa, is a journalist, writer and communications consultant specialising in environmental issues.